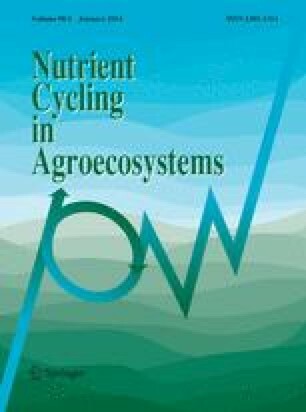 The aim of this study was to evaluate the cumulative net free-living nitrogen (N) fixation and its response to elevated atmospheric carbon dioxide (CO2) in the submerged surface of paddy soil. The study site was an actual paddy area in central Japan that was equipped with a free-air CO2 enrichment (FACE) facility and was composed of four bays, where each bay had an elevated CO2 plot (FACE plot) and an ambient plot. Field incubation was conducted at subplots without N fertilizer application from May 28 to August 18, 2012 (82 days). The CO2 enrichment was an average of +528 ppm during the study period at the subplots. The changes in total N (TN) content in the surface soil (0–1 cm) were determined in comparison to the initial TN content. The cumulative net N fixations during the 82-day study period were 47.1 ± 3.7 and 43.3 ± 5.8 (standard error) kg N ha−1 in the FACE and ambient plots, respectively. The difference between the FACE and ambient plots was not significant (p = 0.05). However, these values were partly affected by the charophyte blooms, which are not involved in N fixation. The results are not conclusive, and the one bay without charophyte blooming displayed a significant increase in the cumulative net N fixation (approximately 10 kg N ha−1) with CO2 enrichment (p < 0.001). We would like to express our gratitude to Messrs. Hironori Wakabayashi and Terushi Kamada, National Institute for Agro-Environmental Sciences, Japan, for their help with the installation of the measuring weirs for irrigation monitoring. This study was supported by a Grant-in-Aid for Scientific Research, No. 22248026 provided by the Japan Society for the Promotion of Science. Tsukuba FACE was established and maintained by “Development of technologies for mitigation and adaptation to climate change in Agriculture, Forestry and Fisheries”, a project provided by the Ministry of Agriculture, Forestry and Fisheries, Japan.